Ideal for business and leisure travellers alike, Good To Go Meet & Greet T3 offers a fast and hassle-free getaway at prices that are sure to impress. From anyone on a tight schedule to those travelling with young children or bulky luggage, the ease of meet and greet parking will ensure smooth progress to the check-in desks. There's no need to catch a transfer bus, simply take a two-minute walk to the nearby terminal building. While you're away, your car will be parked in a nearby, airport-approved car park for the duration of your trip. 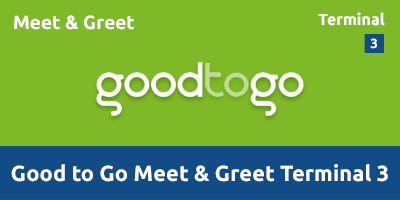 Good To Go Meet & Greet T3 is suitable for Blue Badge holders. If you are using a sat-nav, please enter the postcode TW6 1QG. At the roundabout take the 3rd Exit onto Tunnel Road East. At the next roundabout go straight over and head through the tunnel. Register your arrival & hand over your keys at the Meet & Greet Reception, your car will then be parked for you. Meet & Greet operates between 05:00 - 23:00 daily. At the roundabout take the 3rd Exit (Eastbound) and 1st Exit (Westbound) onto Tunnel Road East. Please call 0742 343 5159 and let Good To Go know about any changes to your arrival time.